Thawing permafrost is threatening to overwhelm attempts to keep the planet from getting too hot for human survival. Without major reductions in the use of fossil fuels, as much as two-thirds of the world’s gigantic storehouse of frozen carbon could be released, a new study reported. That would push global temperatures several degrees higher, making large parts of the planet uninhabitable. Once the Arctic gets warm enough, the carbon and methane emissions from thawing permafrost will kick-start a feedback that will amplify the current warming rate, says Kevin Schaefer, a scientist at the National Snow and Ice Data Center (NSIDC) in Boulder, Colorado. That will likely be irreversible. And we’re less than 20 years from this tipping point. Schaefer prefers to use the term “starting point” for when the 13 million square kilometres of permafrost in Alaska, Canada, Siberia and parts of Europe becomes a major new source of carbon emissions. “Our model projects a starting point 15 to 20 years from now,” Schaefer told IPS. The model used a ‘middle of the road’ scenario with less fossil fuel use than at present. Even at that rate, it found that between 29 and 60 percent of the world’s permafrost will thaw, releasing an extra 190 gigatonnes of carbon by 2200. The study is the first to quantify when and how much carbon will be released and was published this week in the meteorological journal Tellus. “The amount of carbon released is equivalent to half the amount of carbon that has been released into the atmosphere since the dawn of the industrial age,” Schaefer said. The additional carbon from permafrost would increase the average temperatures in the Arctic by eight to 10 degrees C, the study reported. Not only would this utterly transform the Arctic, it would also increase the planet’s average temperature by about three degrees C, agrees Schaefer. And this increase would be on top of the three to six degrees C from continuing to burn fossil fuels over the next 100 years. The Earth’s normal average temperature is 14C, so heating up the entire planet another six to nine degrees C would be like increasing our body temperatures from the normal 37C to a deadly fever of 53 to 60 degrees C.
As catastrophic as all this is, Schaefer acknowledges his study underestimates what is likely to happen. The model does not measure methane releases, which are 40 times as potent in terms of warming as carbon. Methane could have a big impact on temperatures in the short term, he says. “There would be a lot of methane emissions. We’re working on estimating those right now,” he said. The model also does not include emissions from the large region of underwater permafrost. IPS previously reported that an estimated eight million tonnes of methane emissions are bubbling to the surface from the shallow East Siberian Arctic shelf every year. 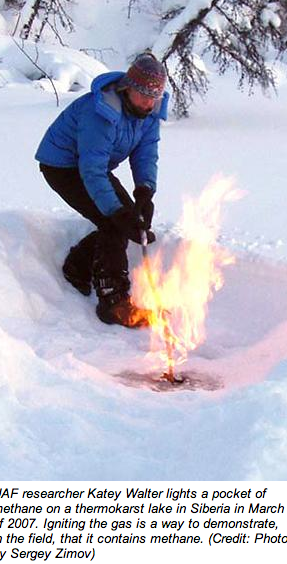 If just one percent of the Arctic undersea methane (also called methane hydrates) reaches the atmosphere, it could quadruple the amount of methane currently in the atmosphere, Vladimir Romanovsky of the University of Alaska in Fairbanks previously told IPS. Nor does the model account for a process called thermokarst erosion, acknowledges Schaefer. This is a widely observed process where meltwater erodes the permafrost and exposes it to warmer temperatures and speeding up the thaw. “We can’t model that yet but it could contribute to major releases of carbon and methane,” he said. None of this has been taken into account by politicians and policy makers looking to cut humanity’s carbon emissions with the agreed on target of keeping global temperatures below two degrees C.
Nor is there a wide appreciation for the fact there is no ‘reverse gear’. Even if all fossil fuel use stopped today, global temperatures would continue to rise and permafrost would thaw for another 20 to 30 years, Schaefer estimates. And once the permafrost carbon is released, “there is no way to put it back into the permafrost”. Even if there was a way to lower the Earth’s human-induced fever, it would take a century or more for thawed permafrost to reform, he said. Permafrost has been warming and thawing since the 1980s. A 2009 study reported that the southernmost permafrost limit had retreated 130 kilometres over the past 50 years in Quebec’s James Bay region. The major loss of sea ice in the Arctic allows the Arctic Ocean to become much warmer, which in turn has increased temperatures of coastal regions an average of three to five degrees C warmer than 30 years ago. More ominously, large parts of the eastern Arctic were 21C higher above normal for a month in the dead of winter this year, as previously reported by IPS. However, while on the edge of a most dangerous precipice, there is a safer path available. A new energy analysis demonstrates that fossil fuel energy could be virtually phased out by 2050 while offering comfortable lifestyles for all. The Energy Report by Ecofys, a leading energy consulting firm in the Netherlands, shows that humanity could meet 95 percent of energy needs with renewables utilising today’s technologies. 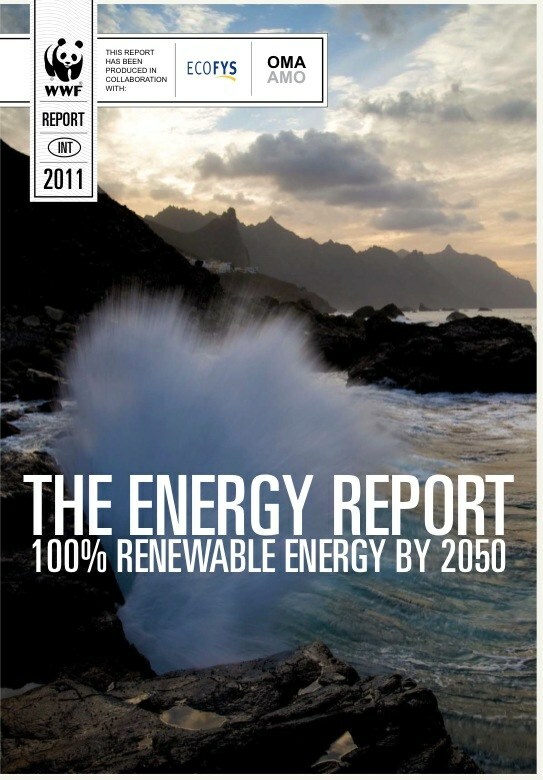 “The Energy Report shows that in four decades we can have a world of vibrant economies and societies powered entirely by clean, cheap and renewable energy and with a vastly improved quality of life,” said WWF Director General Jim Leape. WWF worked on the report with Ecofys. “The report is more than a scenario – it’s a call for action. We can achieve a cleaner, renewable future, but we must start now,” Leape said in a statement. There are lots like it : and saying that it is all corporate/polluter propaganda is to project propaganda likewise. There has to be more than ‘killing the messenger’ and ‘poisoning the well’ debunking or ‘appeals to authority’ when claiming scientific established fact in reliably foretelling the future : especially when there are many scientists saying claims are exaggerated, overblown or otherwise flawed. That headline (“NASA: Solar cycle may cause “dangerous” global cooling in a few years time”) has been made up by the website at that link, to pretend that NASA is stating something which (as Stephen has stated) it most definitely isn’t. Shameful attempt at deception. But I doubt you want to learn. You’ve made up your mind judging by the rest of your comment. …claiming scientific established fact in reliably foretelling the future. I requested information. ‘Made up my mind’ is standard trope. Congratulations on insightful idiocy. As a matter of fact, solar output is not the sole proposed driver of climactic conditions – which is why I collect ideas, being neither a scientist nor a person convinced by a single graph which, though interesting, does not exhaust the list of possibilities. There is plenty of info from experts and scientists on this site. Suggest you look at these w an open mind and then comment. “opit” is clearly a denial-bot. He quotes an apparently authoritative source for a false claim, a claim that anyone with half a clue about climate science would know to be fraudulent. However, the unwary reader might not know that, and might not chase down the source, going away with the notion that a “debate” was in progress. Result, a “win” for deniers. You’ve nailed it Toby. It is sad but there a lot of people being manipulated by fossil fuel PR efforts to do their dirty work for them. Toby may well be right. It has recently been confirmed that denier bots are real. Thanks for this very useful summary of some important research. However, the question I’m left with is whether the safer path you point towards at the end will be sufficient to avoid an Arctic meltdown and associated methane release that overwhelms our attempts at emissions reductions. Do we need something even more radical than 95% renewable power by 2050? I sure hope not Byron because the report is not just about switching from fossil to renewables, its a major reduction in energy use to below 2005 levels with 2 billion more people. I’d like to do a full story on the report but don’t have any funding to invest the time. Thanks for pointing this out. I haven’t yet had time to look at the report in more detail, but have saved it for future reading. You might be interested to have a look at this recent(ish) report from about 100 scientists and engineers who volunteered their time (i.e. neither industry nor government funded) to substantiate the claim that Australia could move to 100% renewable (no nuclear) energy by 2020 for a short term cost of AUD$8 per week per household (and a longer term net economic gain). Climate Deniers are paid to haunt climate sites with the same information all over the web. Actually the prospect of methane melt, is one of the most frightening aspects of global warming. Since methane hydrates are now fully loaded- after the PETM 55 million yrs ago. No one knows at what temperature they will begin to be released- but has C02 ever risen this fast in the past? The real answer may be very chilling. Peter I am almost certain CO2 is rising faster than any time in the past. The deep past is measured in tens of thousands of years because we can’t measure year to year changes from millions of years ago. I’m looking forward to them. As a newcomer here, I’ve been enjoying reading around a little. As for the ZCA report, I’m afraid I’ve just across this fairly withering critique suggesting that the number of overly rosy assumptions built into the numbers makes the economic claims unbelievably low (i.e. it would be considerably more expensive to do this). Of course, this doesn’t mean we shouldn’t start heading in that direction and finding better ways of doing it as we go. Bryon there are plenty of critics out there but precious few who offer better alternatives (most offer none at all). No analysis is perfect, what we need to do s to learn by doing. Indeed. I fully agree, though it’s important to not oversell how easy the path ahead is actually likely to be. I think this is actually a somewhat sympathetic critic. PS opit (below) is a troll, if you hadn’t worked it out. Well, if you aren’t totally convinced through your own brilliant analysis in a vacuum that I don’t exist and/or am a mindless drone – you might see if I have anything useful in my ‘Energy’ files. I have read recurring commentary, for instance, that nuclear power has been unfairly demonized. In a seemingly unrelated situation that nonetheless ended up sustaining petroleum dependency,I do know that foreign governments signing on to the NPT are warred on for their complicity in trying to rein in nuclear weapons proliferation – the putative reason for the document. We just have to learn to take what is needed, will be our greatest human achievement ever. No more idiocy of collective suicide by consumption. 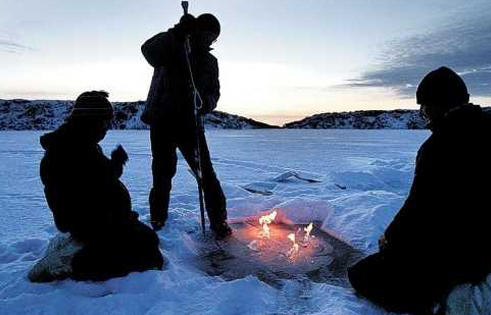 Then learn how to save personal energy and explore the unknown. Break our bubble of perception, our world of internal dialogue, a manageable blob of nonsense.